Tensions ran high as Eleanor Roosevelt approached the podium to address the delegates of the 1940 Democratic National Convention. The prior evening’s raucous proceedings, which led to FDR’s nomination for an unprecedented third term candidacy, had been long and trying. 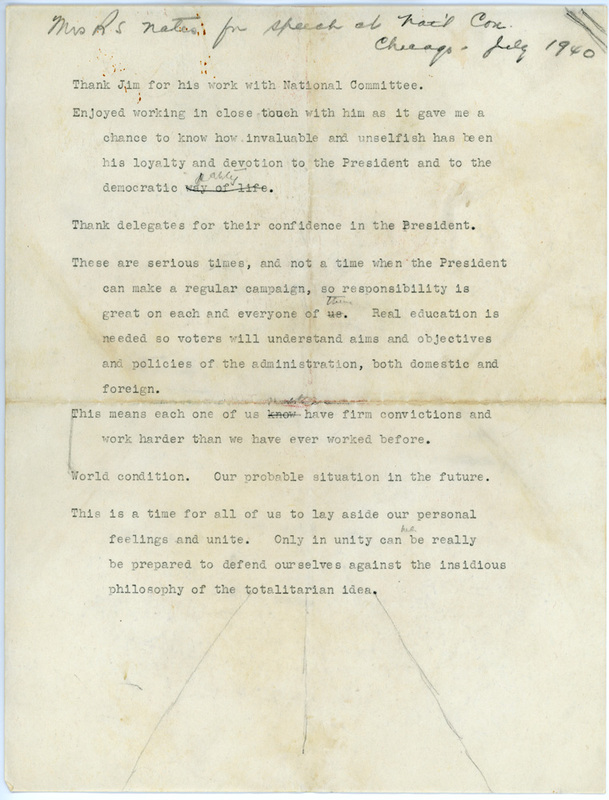 Now FDR’s subsequent insistence on Henry Wallace as Vice Presidential running mate was unpopular and controversial. The war in Europe loomed threateningly over the American psyche and ideological differences concerning neutrality, and a host of other political issues exposed fissures in the Democratic Party ranks. The Convention was at a standstill and bordered on outright revolt. “You must know that this is the time when all good men and women give every bit of service and strength to their country that they have to give. This is the time when it is the United States that we fight for, the domestic policies that we have established as a party that we must believe in, that we must carry forward, and in the world we have a position of great responsibility. The effect of her words was transformative. A silence marked by respect and admiration followed her message, somberly and palpably shifting the atmosphere. Balloting began immediately after she sat down and the Convention went on to nominate Henry A. Wallace to run alongside Franklin D. Roosevelt in the 1940 election.